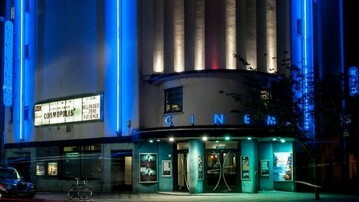 Visit this cinema run by a not for profit charity comprising local people. The building was refurbished in Art Deco style by cult architect FE Bromige in 1937 and reopened as the Classic Cinema Dalston, within the shell of the earlier cinema. The ceiling and upper walls of the earlier auditorium survive, only accessible from the roof. As many cinemas were remodelled with the arrival of sound in the 1930s, nowhere else are two very different auditoria found one within the other. According to English Heritage, this is "an exceptionally rare survival". The exterior has remained almost unchanged since the thirties.In 1976 the cinema came under independent cooperative management. Since 1979 it has been run as a not-for-profit registered charity with an elected board of local people who act as volunteer trustees. The current chairman of the board is Patrick Lyons. The blue and pink Art Deco interior was restored in 1997, remaining faithful to Bromige's design, and the building became Grade II listed in 1999. Elain Harwood of English Heritage called the cinema a 'remarkable' work of ‘sweeping curves’. In August 2016 it was announced that a second screen would be added in the basement space of the Rio, opening in summer 2017.